You are probably thinking that the number one reason why people who want to be generous can’t is because they can’t afford it. That may seem obvious, but I believe the real reason is different. If you have been around me very long, you have probably heard me say something like, “You can’t afford NOT to give.”I base this fully on God’s promises to supply our needs, to bless us when we give, to lift the curse off our money when we tithe, and to rebuke the things that devour our money when we trust in Him. The reality is that most Americans are in such deep debt that they have lost hope. Most don’t think they could survive a $1,000 crisis. The average American is over $16,000 in credit card debt and the average student loan exceeds $50,000. No wonder so many live from paycheck to paycheck. Is there any wonder that there are over 1300 verses in the Bible about money and possessions? We need God’s help and God’s perspective. As with every part of the Christian life, money management begins with faith. While you may think that I am referring to the faith to tithe and trust God to give, I believe it must start further back than that. It begins with the faith to manage our money, our desires, our expectations, and our contentment. If you are so far in debt that you are about to lose your house, your apartment, or your car, it probably feels oppressive when a pastor challenges you to give. Jesus said, “It is more blessed to give than to receive.” That is why I say things like, “Generous people are happy people” and, “We want this for yournot from you.” The blessing of giving begins with understanding that God owns everything, and we are simply the managers of what is His. 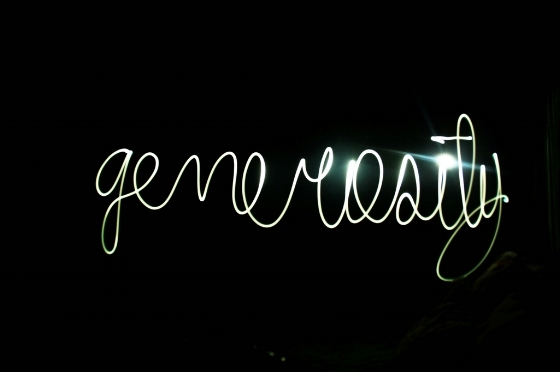 I truly believe that most Christians have a desire to give and be generous. Many have a faith problem rather than a desire problem. There are always more than enough resources if we look to the Heavenly Father. God is the one who owns the resources and he has the will to provide. He loves you. He has promised to supply all your needs. Notice that he supplies “according to” not “out of.” If you were to ask me for money because you have a need and I decided to help because I have the ability and desire, then I have two options. First, I could supply your needs “out of” my resources. That means there is a limit. I have decided that there will be a limited amount of money I will give you because I am giving to you “out of” my bank account. On the other hand, if I agree to help you “according to” my resources, then I have just given you carte blanche. You can expect that I will meet your needs all the way to the limit of my resources. God promises to meet our needs “according to his riches in glory by Christ Jesus.” He has no limit on his resources. I believe that bringing the full tithe is the starting point for conquering the poverty mentality. Of course, committing to this faith endeavor will cause you to look at ALL of your money God’s way. It takes faith to believe God owns everything. It takes faith to believe that you can get out of debt. It takes faith to believe that you can build margin in your life. But it also requires action! Faith without works is dead, according to the Bible. The beginning point is to ask God to give you the faith to tithe AND to manage all of your money as if God owns it all. There is help available. There are many resources to help you learn how to conquer debt and build margin financially. If you struggle with a poverty mentality from time to time, I hope you will consider these things to help you start believing in God’s abundance. God owns it all. He has more than enough to meet your needs. God loves you and wants to bless you. If earthly fathers love to meet the needs of their children, how much more does our perfect, righteous, amazing Heavenly Father love to meet our needs? I must act in faith. I must trust his promises and goodness. I must center my focus on God’s loving nature and believe that he will supply. I must stop living in fear with a scarcity mentality and realize that there are more than enough resources to meet my needs. I must change my actions and get a plan. It would be irresponsible to continue to live with unbearable debt and HOPE that a raise or a sudden windfall would solve my financial problems. There is hope! But you can’t continue to live the same way, do the same things, and spend the same way and expect things to improve magically. As you begin to acknowledge, practice, and believe these things, your faith will start to transform your thinking. When that happens, then there is nothing you can’t do! You can get out of debt, build margin, and find financial peace. By asking God for the faith to manage all your moneyis the starting point for discovering the promise of Jesus: It is more blessed to give than to receive. If You Won the Lottery, Would You Be Happier?